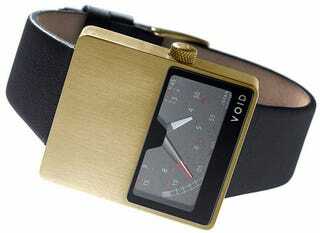 If you think about it—really think about it—or even half-assedly think about it—this Void VO2 Retrograde watch isn't so different from an iMac. But whereas an iMac* focuses on its glass screen accented by a tiny strip of aluminum, this Void centerpieces its brushed stainless steel—the informationless void of the watch, if you will—as much just as much as its glass-covered speed dial watch face. Void's design admits that it's only half for utility, saving the other half completely for style. *I thought my iMac comparison was somewhat brilliant before realizing I'd probably unconsciously plagiarized it from my source. Smooches, Rob.